Do you love listening to music while working on your Windows computer? We’re sure you use earphones or headphones to keep things private.. However, sometimes on Windows 10 computer, you may experience weird sounds while using one earphone, which would get started if you plug in both the earphones. 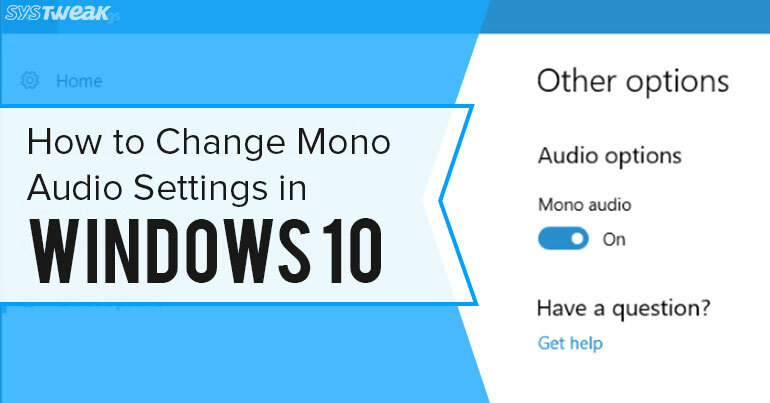 Most of us blame our earphones, but actually, it happens because Mono audio is turned off by default in Windows 10. It is on stereo mode. In this article, we will understand the basic difference between Mono and Stereo audio settings and how to Switch between Mono and Stereo on Windows 10. The basic difference is because of sound channels in Mono audio there is a single sound channel and signal for this sound channel is distributed equally to both the speakers. On the other hand, in Stereo there are different sound channels and different speakers get different sound signals. This is why when you keep Mono settings turned off you cannot hear the perfect sound in the single earbud. You can understand the distribution of sound signals in both the settings with the help of the given diagram. How to Switch between Mono and Stereo in Windows 10? So, if you want to listen to music only through one earphone here is how you can turn on Mono Settings. You will see the list of categories under settings. Now click on Ease of Access. At the bottom, right of ease of access settings you will see Other Options (The last options). In other Options, the last option will be Mono audio. Toggle the switch to turn it on. That’s it! Now you can enjoy your favorite music in only one earphone. You can turn Mono off whenever you want to listen to music in stereo mode. If you want to identify the difference between both the audio settings then use both the earphones and change these settings frequently. This is how you can stay connected to the real world and can enjoy music at the same time.